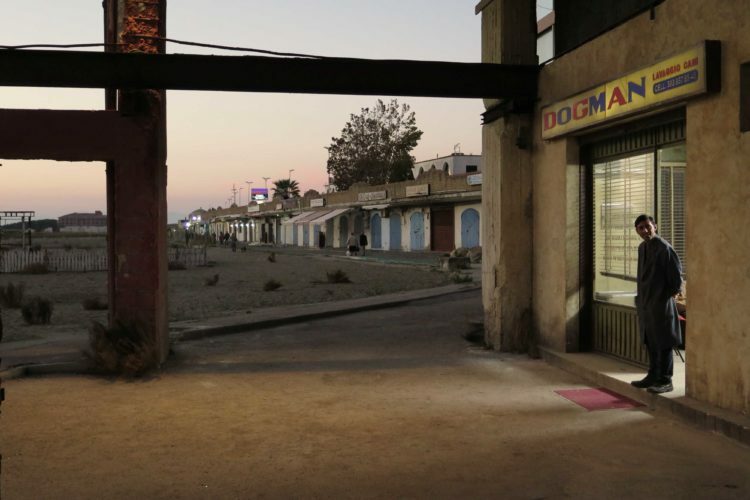 In the weeks leading up to the writing of this piece, a usual situation for Italian cinema and its international reputation happened: the exclusion of Dogman, a film that had great expectations, from the final nominations for the Best Foreign Film at the Academy Awards. Again on this occasion, as often happened in the past, it is a film that has been awarded in international festivals and directed by a recognized filmmaker (Matteo Garrone), who had previously been celebrated for other, very successful films. To be included in the competition for the Oscar nomination, a film must follow a long, uncertain path: producers submit their films for consideration to ANICA, the Italian association of film producers and entrepreneurs; it nominates a selection committee composed by critics and practitioners, which decides about the actual submission. Subsequently, the selected entry undergoes the scrutiny of Academy members, who may include it first in the shortlist and eventually in the final nomination list. In the last fifteen years, only two Italian films were nominated: Don’t Tell (Cristina Comencini, 2006) and The Great Beauty (2014), the last one being the sole winner of the coveted statuette. 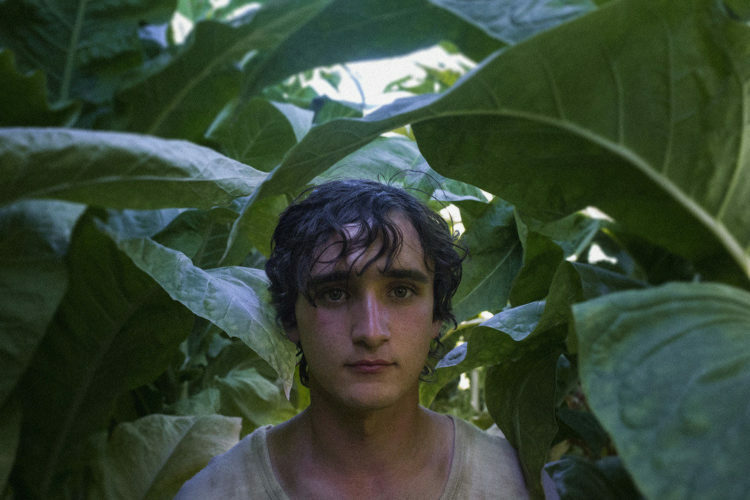 The submission, selection and the highly unlikely award facilitate the economic success of a film in terms that are easy to realize but quite more difficult to demonstrate, as Marco Cucco argued here. If the question concerning the actual promotional function of the Oscar is difficult to answer, even more interesting, we think, is to try to understand how these films perform abroad, beyond the festival circuit and after the theatrical distribution window: what happens in terms of availability and visibility when they are made accessible internationally on OTT platforms, both transactional (Google Play, iTunes, …) and subscription-based (Netflix, Amazon Prime Video, Hulu, …)? To put it differently, are the films that the national community of filmmakers, by means of a precise selection process, considers the most viable for international circulation and critical acclaim the same that also prove themselves apt to be distributed and circulate outside Italy over OTT platforms? As it is widely known, and as the Italian producers and distributors’ associations claimed recently, OTT (over-the top) operators do not share figures about the consumption of their films. As such, we must look to indirect evidence of the “success” of these titles, such as the frequency of their presence in different platforms on a global basis, their rental costs and sell-through fees (in the case of TVOD), their prominence in the libraries, and the promotional strategies employed for their circulation. 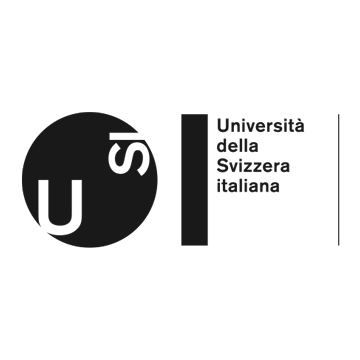 Starting from the very beginning of this process, we would like to argue that Italian submissions seem to have been selected, over the last fifteen years, according to some unwritten patterns, which reflect the typologies of Italian films that, in the past, proved to be successful abroad. We can sketch four interconnected “genres”, analytical typologies useful to distinguish the selected Italian films and their international circulation. The most popular one can be labeled “casual art blockbuster”. It is the most profoundly rooted typology in our national art cinema tradition, an updated version of what Spinazzola called “superspettacolo d’autore”: high budget films boasting a considerable production value, directed by renowned filmmakers and focusing their narratives around elements of the Italian history and heritage that are easily recognizable in the domestic market as well as abroad, such as organized crime in Gomorrah (Matteo Garrone, 2009), national history and politics in Baarìa (Giuseppe Tornatore, 2010), or the Roman cityscape in The Great Beauty (Paolo Sorrentino, 2014). Dogman could safely be added to this category. A second typology is that of films that, to use Bayman’s words, mix “the operatic and the everyday” in addressing relevant themes or re-elaborating traditional genres through a flourishing and idiosyncratic style. This is the case of dramas dedicated to the international migration like those directed by Emanuele Crialese, The Golden Door (2007) and Terraferma (2012), as well as of a psychological thriller like The Unknown Woman (Giuseppe Tornatore, 2008), or a crime movie like Don’t Be Bad (Claudio Caligari, 2016). We would name a third category the “well-intentioned attempts”, which are characterized by generally good domestic performances, but with limited critical success abroad. In this case we find well-crafted middlebrow productions belonging to genres as the family melodrama (Don’t Tell, Gianni Amelio’s The Keys of the House, 2005) and the dramatic comedy (The First Beautiful Thing, 2011, and Human Capital, 2015, both directed by Paolo Virzì). 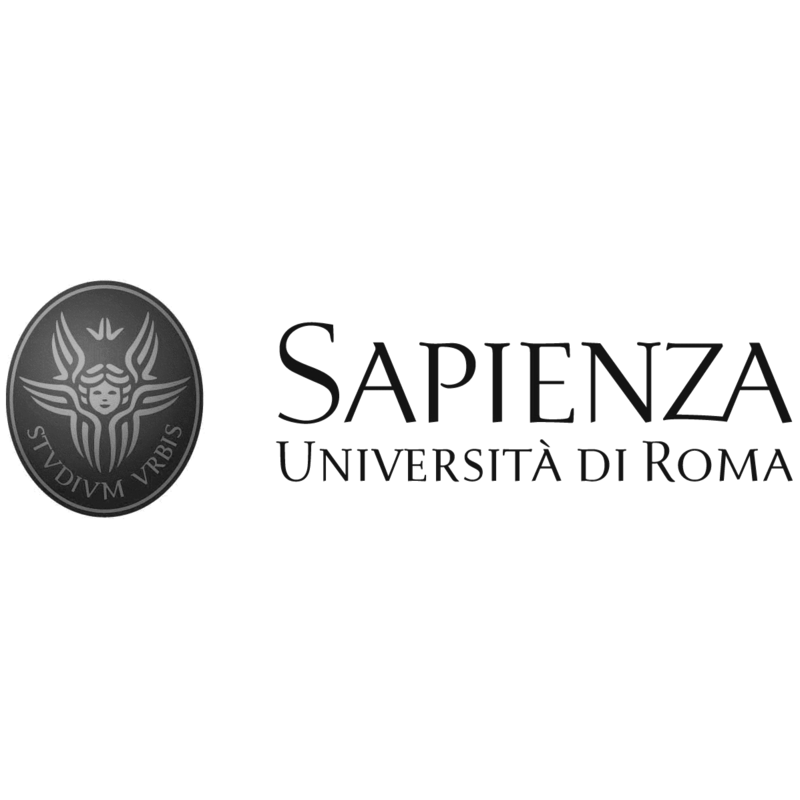 A fourth and last typology is that of “Italian world cinema”. Low budget, or stylistically restrained films dedicated to marginal and subaltern realities, such as the real life and artistic activities of a group of convicts staging in prison Shakespeare’s Julius Ceasar in Ceasar Must Die (Paolo and Vittorio Taviani, 2013), the daily existence of a kid in the island of Lampedusa in the time of massive migration from the African continent in Fire at Sea (Gianfranco Rosi, 2013), the problematic coming of age of a Roma teenager in A Ciambra (Jonas Caripignano, 2018). Jumping to the end of Italian films’ global value chain, and taking into account the distribution of these titles via digital on-demand services and platforms, we can see a strong correspondence between the four typologies and their different paths of global circulation. Some general aspects have necessarily to be considered to put in the right context the presence of films (and foreign films, especially) on on-demand services. Digital platforms have large libraries but a short memory, focusing mainly on most recent films. Transactional services offer a greater number of titles, but also random cataloguing and stock products, while subscriptional ones allow a cherry-picked selection. The scenario changes constantly, and quickly, due to rights acquisitions and expiring licenses, leading to the sudden (dis)appearance of some titles. However, despite these difficulties, putting together both the scarce data and other traces, it is clear how “casual art blockbusters” constitute a (relative) success story, with a quite strong presence into foreign streaming services (often in subtitled versions) that allows a wide accessibility both through rental/sell-through and subscription platforms. Gomorrah, for example, is available on Amazon Prime Video in Germany, in the US, in Austria, on Mubi in Australia, on FilmIn in Spain, and on several other TVODs in the UK, in France, in the Scandinavian countries (i.e. iTunes, Google Play). 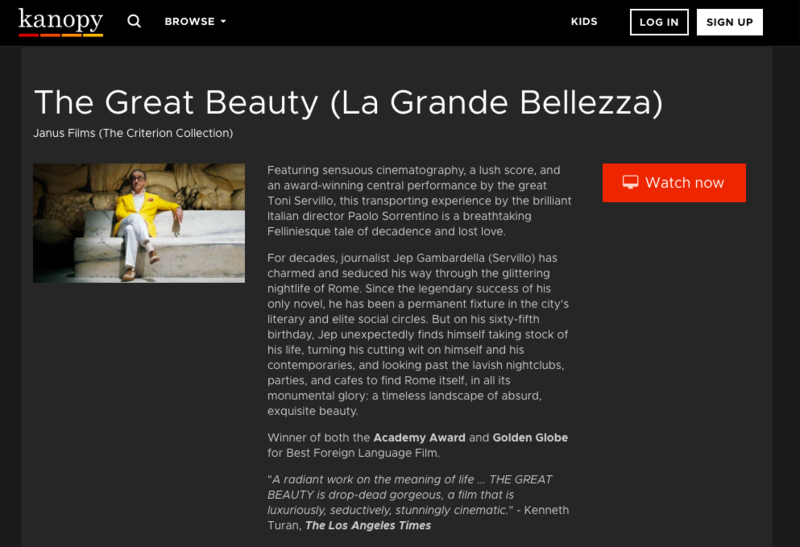 The Great Beauty has been released by Netflix in Japan, Canada and the UK, by Kanopy in the United States, by Hbo in Spain, by Sky Deutschland in Germany. On the opposite side of the spectrum, the films included in the “well-intentioned attempts” category have no global presence on digital platforms. Virzì’s The First Beautiful Thing and Human Capital, or Comencini’s Oscar nominated Don’t Tell are nowhere to be found. The films included into the other two typologies, the safe bets mixing the operatic and the everyday and the Italian way to world cinema, are quite similar and stay in the middle. They balance a low availability on transactional services with a more substantial presence in branding SVODs. 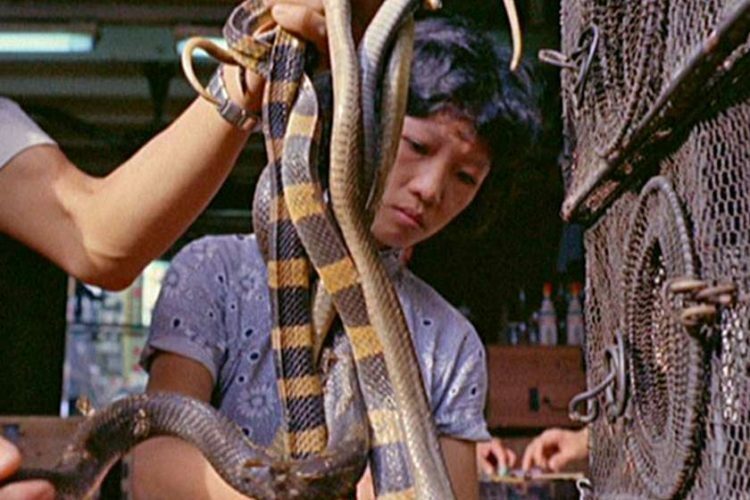 These films act as items in the showcase of a boutique, less relevant in themselves (i.e. actual viewing), more in the implications of their presence (i.e. hype, perceived quality, proof showing the relevance of OTT libraries). So, in several countries Netflix includes in its catalogue The Golden Door, Terraferma and Caesar Must Die; Amazon has Don’t Be Bad; both released Fire at Sea. Researching the global circulation of the Italian submissions to the Oscars has shown us how the equivalence between the hopes of the national professional community and the actual presence in many foreign markets is far from direct. There is not a trajectory which is valid for all the Italian cinema abroad, but different paths and tendencies, and the recognition given by the submission is just one of many other factors, together with the popularity of the actors, plots, randomness of package deals, etc. Thanks to digital platforms, the availability of these films has already increased, and it slowly continues to widen. However, this growing presence does not imply a higher visibility and prominence, and often is not accompanied by a more careful labeling, packaging and offer to audiences. And even the best efforts of circulating Italian cinema abroad, in this post-festival and post-theatrical context, are still peripheral, losing many possible opportunities. At least, for now.